We have 3 active mobile customer service units plus a number of portable service units, which operate in rural, remote and high growth areas of Queensland. These mobile units provide a variety of services, and allow us to respond quickly to busy areas. ask questions about department services. You do not need to make an appointment to visit a mobile unit. However, please make sure you have the correct evidence of identity. You can find the relevant forms and find information on licence fees or receive a quote for registration fees on our website. 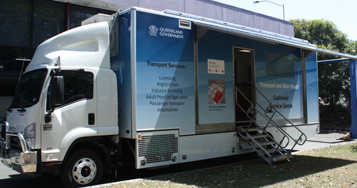 Payment methods include EFTPOS, cash and cheque at South-east Queensland mobile units. Southern and Central Queensland mobile units accept EFTPOS payments only. Disabled access is available on all mobile units. Contact us if you have any questions about the mobile units or the schedule. Please note: the dates and times are subject to change. Payment methods accepted include EFTPOS, cash and cheque. Practical test bookings for central region can be made by contacting the Call Centre on 13 23 90 Monday to Friday from 8am to 5pm, excluding public holidays. Practical test bookings for southern region can be made contacting the Dalby Customer Service Centre on 4672 4600.